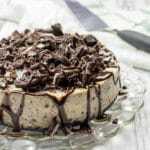 This decadent version of Instant Pot cheesecake is made with an Oreo cookie crust, plus it has crushed Oreos stirred into the batter. Spray the sides of a 7-inch springform pan with nonstick cooking spray and line the bottom with a piece of parchment paper or foil. Mix the finely crushed Oreo cookies and melted butter. Spread the mixture evenly onto the bottom of the pan and press down firmly. Beat the softened cream cheese in an electric mixer on medium speed until smooth. Add the sugar and beat until the sugar is fully incorporated. Add the eggs and beat until blended. Then stir in the vanilla, sour cream, and 3/4 cup chopped Oreos. Pour the cream cheese mixture over the crust in the springform pan and spread evenly. Place a sheet of foil over the top of the pan and seal by crimping along the edges. Pour water into the Instant Pot. Place a trivet or rack into the bottom of the Instant Pot. If your trivet doesn't have handles, make sling using a long piece of foil, folded into a long strip. Place the springform pan into the pot using the sling and set it on top of the trivet. Lock your Instant Pot lid, make sure the pressure valve is set to sealed, and cook under high pressure for 35 minutes. After the pressure cycle has completed, let the pressure release naturally for about 10 minutes before releasing the remaining pressure manually. Using the foil sling, remove the pan from the Instant Pot.Remove the foil on top, and cool on the counter for about an hour. Place in the refrigerator to set for at least another 6 hours, preferably overnight. Before serving, top with chopped pieces of Oreo cookies and drizzle with chocolate sauce if desired. This recipe was adapted from Dad Cooks Dinner's New York Pressure Cooker Cheesecake recipe.